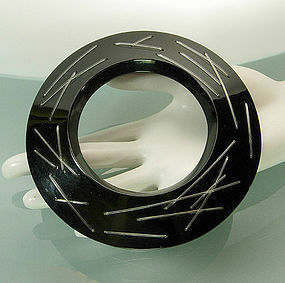 Stunning statement bangle in opaque black resin decorated with soft clear plastic threads "stitched" through the resin. Unattributed, but probably European. Circa 1980 or 1990. I am selling a very similar bangle in orange resin. This is a big piece and best worn over a long sleeved sweater or T shirt, or pushed up the forearm stacked with other bangles. 1 1/4 inches wide (sideways) and 3/4 inch thick. The inner inside diameter is 2 5/8 inches and the outer inside diameter is 3 inches. Excellent condition. Display form is lifesize. Photos enlarged to show detail.